Welcome to my "Strength and Comparison" article for the coming month. The article "Ranking, Rating and Score" has also been published. 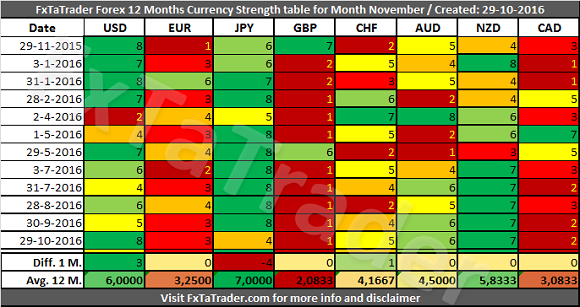 In the Currency Strength table the USD is the strongest currency, the GBP is the weakest and the JPY is currently in a dip while all the other currencies did not change except for the CHF which is 1 point higher. For more details read both of my articles where the relevant Charts and Tables are provided. In the last Month the JPY is in a dip with a score of 4 being the weakest one of the strong currencies. 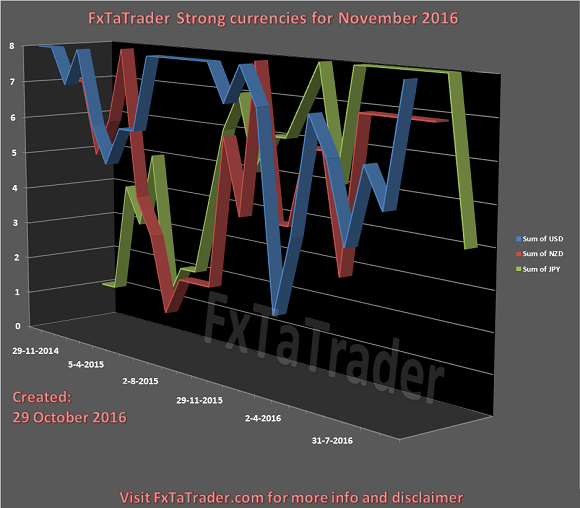 However, it is clear to see that this currency was in the last period very strong, the strongest of all for 6 months. For that reason it does not seem that this currency will continue to weaken. There will be at least a period of consolidation before the currency will get close to a Neutral classification. It has at the moment the highest Avg. 12 M. Currency Score of all currencies! The NZD is very stable lately while the USD is gaining strength and coming back to the area of the Strong currencies. 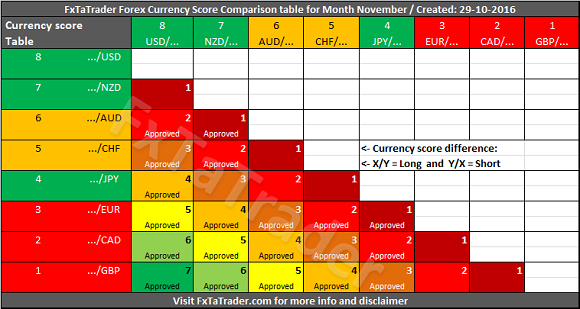 Some of the pairs in the "Currency Comparison Table" comply for a longer term trade based on the Technical Analysis (TA) of the Daily and Monthly chart. For the coming month these seem to be: GBP/NZD, GBP/USD, GBP/CHF, NZD/CAD, EUR/GBP, AUD/CAD, GBP/AUD, GBP/JPY, EUR/USD and USD/CHF. For the GBP pairs the GBP/NZD seems the most interesting not being yet in the overbought/oversold followed by the GBP/CHF which is a little bit in that area but may stay within when the new month starts. The GBP/USD and EUR/GBP are in extreme overbough/oversold area according to the monthly chart using the Bollinger Band(20). Strong overbough/oversold areas in the Monthly chart may still offer a good opportunity but the pull back may be strong!